Restore a rustic and weathered down ghost town in Wild West Story - The Beginnings, a marvelous matching encounter with a western theme. If you like this free game, try Lost Inca Prophecy 2 - The Hollow Island. Bella and Coyote Cub are two drifters who stumble across an abandoned mining town. Looking to start a new life for themselves, they decide to mine gold and help the town flourish once again, perhaps finding a home to call their own. Restoring a town however, while dealing with a rowdy group of desperadoes, can prove to be more challenging than imagined. Join Bella and Coyote Cub on this amazing journey to create a place of their own. Challenge 100 original levels across the territory and rebuild the general store, the farm, the lodge, and more. Collect resources to build even more structures and bring in new settlers. 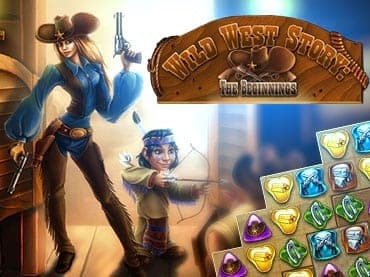 With extraordinary power-ups, a unique clear-the-path matching mechanic, and additional Hidden Object levels, this is one Wild West hoedown you're sure to enjoy! - Play extra hidden object levels for more power-ups and surprises! If you have questions about Wild West Story game, please contact us using this form.